Shuttle Service – Zambezi House is an exciting casual dining café concept in Victoria Falls • Zimbabwe. 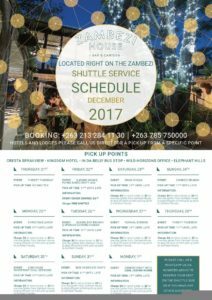 From the 22nd of December to the 2nd of January Zambezi House will offer a shuttle service from 11am until late daily. The cost is $4 for a return trip.